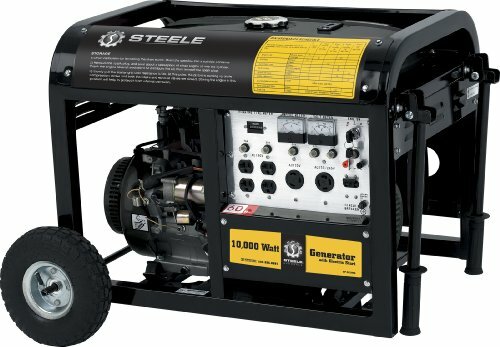 Steele Products SP-GG1000E 10,000 Watt 4-Cycle Gas Powered Portable Generator With Wheel Kit & Electric Start was listed on Amazon for $1,099.99, selling for $1,099.99 USD brand new. Manufactured by Steele Products. There are 3 units left brand new. 10,000 watt 4-Cycle engine, 15 HP gasoline powered generator. Runs 8 hours, 7.7 gallon tank @ 76dB. Electric start with mobility kit.